Goa Giri Putri (also known as Karangsari Cave) is another Hindu temple in Bali, but this one is unique because it’s inside of a huge natural cave. The hidden cave is located halfway up a mountain, on the east side of Nusa Penida island. After crawling through a tiny hole in the side of the mountain, the inside opens up to a huge room with high ceilings. It’s a big dark cave about 300 meters long, and if you follow it all the way to the opposite end, it exits into some dense green hills. To enter the cave, you get to crawl through this small opening. It’s a tight squeeze. We saw some spiders inside. You’ll see these green hills when you exit the cave on the opposite end. The cave is on the east side of Nusa Penida island. The parking area is accessible by car or scooter, about 15 minutes drive from the Sampalan docks or accommodation in northern Penida. From the parking lot, it’s a short 5-10 minute walk uphill to reach the cave entrance. 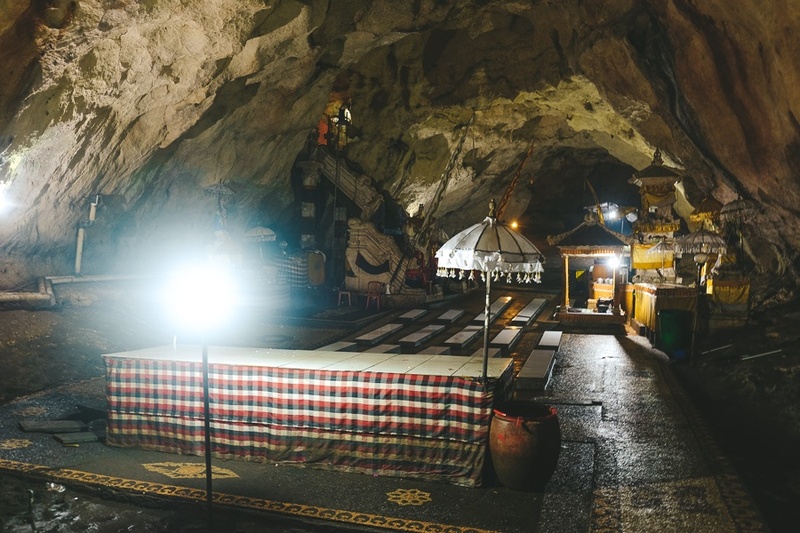 There’s a small fee for renting a sarong and then a second small fee to actually enter the cave. Looking for more info on how to get to Nusa Penida island in the first place? You can find that here.